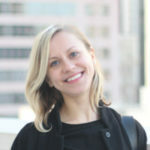 Lina Fedirko is a Senior Program Associate on the Transportation and Advisory and Research teams at ClimateWorks Foundation. Lina’s research and programmatic implementation to date has focused on global urban climate change and transportation policy. Most recently, Lina contributed policy research to the Urban Transportation Chapter of Climate Change and Cities, Second Assessment Report of the Urban Climate Change Research Network (UCCRN), a state-of-knowledge publication examining 16 urban sectors with respect to climate issues. Locally, Lina assisted a New York City Economic Development Corporation in planning a $1.2 million program addressing access issues in low income neighborhoods, and led a transit-oriented development zoning study for a housing non-profit examining flood impacts and adaptation options following Hurricane Irene. Globally, Lina has collaborated with UN Habitat Cities and Climate Change initiative to evaluate the effectiveness of Participatory Climate Change Risk Assessments in South-East Asia and the Pacific. Lina earned an MS in Urban Policy Analysis and Sustainability Strategies from Milano School of International Affairs, Management, and Urban Policy at the New School University. She holds a BFA from Pratt Institute. Lina is fluent in Ukrainian and conversational in Russian and Polish.